New York-based New Media Investment Group bought the Daytona Beach News Journal and Halifax Media’s three dozen newspapers for $280 million in cash today. New Media is a publicly traded company that owns 402 small to mid-size community publications. FlaglerLive ended October with close to 550,000 readers for the month, a new record and further indication that as print struggles to maintain its mass-market appeal, the media landscape is changing too rapidly to accommodate old models. Flagler County Sheriff Jim Manfre was surprised by an unexpected proposal from the owner of Roma Court, the chronically vacant strip mall on Palm Coast Parkway, to lease the building to the county for sheriff’s operations, and cited several factors that fall outside his preferred options. Facing a small but persistent barrage of critics over the $1.23 million acquisition of the old hospital in Bunnell, County Administrator Craig Coffey and County Commission Chairman Nate McLaughlin Monday rebuffed the critics by attacking their sources or their information, though their own claims were at times gravely shaky, or outright wrong. David Ayres, named one of Radio Ink’s 50 top radio managers in America, steered away from his parents’ tool and die shop to take on a career in radio and TV. 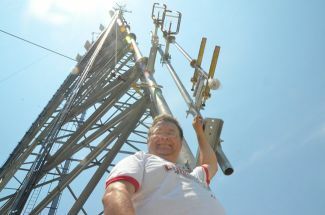 He’s is ending one of his more successful years after overseeing the expansion of Flagler County Broadcasting to a fourth radio station. When Palm Coast City Councilman Bill Lewis took to the floor of a council meeting to correct a fact in a FlaglerLive column, which had already been corrected, he committed more than six errors of his own, including about his own personal history. Lewis’s errors bear correcting as publicly as he committed them. What was behind what sounded like a retraction on synthetic marijuana by WNZF’s David Ayres on his Free For All Friday show last week? Private discussions between Palm Coast Council member Bill McGuire with Mayor Jon Netts, and a letter Netts wrote Ayres, that the council never discussed openly–even as the council has yet to vote finally on the matter. With State Attorney R.J. Larizza, Flagler Sheriff Don Fleming and Putnam Sheriff Jeff Hardy in starring roles (all three are running for re-election next month), Wednesday was the latest shameless example of local and state police using a minor drug sweep for maximum political effect, at taxpayers’ expense. Warren Buffett just bought 63 newspapers from Media General, but not the Tampa Tribune, which is in talks with Halifax Media, owner of the Daytona Beach News-Journal. The decline, while slower than in previous years, continued at the Daytona Beach News-Journal, with average weekday circulation falling to 2.3 percent in the period ending March 31, and 1.5 percent on Sundays. The News-Journal’s 2,400-square-foot office in the St. Joe’s Business Park is less than a quarter the size of its old bureau on SR100, closed three years ago, and a concession that it can no longer address its Flagler competition–including a weekly newspaper and three radio stations–long distance. The Palm Coast Observer’s move would be a frontal assault on the Daytona Beach News-Journal’s diminishing hold on the Flagler market, where the paper has also been contending with competition from three new radio stations and online media. Each title went for barely $9 million, less than half the $20 million Halifax Media paid for the Daytona Beach News-Journal alone when it acquired that paper in April 2010–at discount from the $300 million price originally set by a federal judge in 2006. The Palm Coast Observer’s latest audit shows a weekly print run of 25,000 and a household reach in Palm Coast exceeding 60 percent, compared with the News-Journal’s daily reach of 20 percent. The News-Journal’s losses–the paper now reaches just a fifth of Flagler households–are at odds with gains at the St. Augustine Record and an end to declines, for now, at the Orlando Sentinel and the Jacksonville Times-Union. There’s nothing “fair and balanced” about local media’s failure to have reported on the $500 Waste Pro donation to DeLorenzo before it was pointed out to them–or continuing attempts to paper over the ethics and judgment breach with partial rationales. Several key members of the Bankroft family which controlled The Wall Street Journal say they would not have agreed to sell the prestigious daily to Rupert Murdoch if they’d been aware of News International’s conduct in the phone-hacking scandal at the time of the deal. Anthony’s isn’t murder-trial coverage. It’s voyeurism on a bimbo scale. If Anthony had been middle aged, crinkled, overweight, if she’d not been white, this level of media fixation would have been unthinkable. FlaglerLive Idle As We Switch To a More Powerful Server. Meanwhile, Please Help. In a letter to readers, FlaglerLive.com Board Chairman Merrill Shapiro says the switch is compelled by growing volumes of readers. He asks you to pledge regular financial contributions to FlaglerLive to ensure the kind of reporting you’ve come to depend on. On County Administrator Craig Coffey’s orders, the 9:30 a.m. daily “stakeholder’s meeting” on the fires, which includes all agencies and governments involved, politicians, and even members of the public, is closed to media. After hosting “Open Lines” for two years, and with Rush Limbaugh coming on, WNZF General manager David Ayres is shuffling the station’s lineup. He’ll host a weekly Saturday show. Robert Leard of Palm Coast’s R section dropped his subscription last year. A salesman showed up and pounded on his door Saturday night. Frightened, Leard told him to “get the hell away from my door.” All over $3.97. The paper is making fewer changes than meet the eye while continuing to attempt to do a little more with far less. The Palm Coast Observer’s managing editor has a new blog full of tiny jewels of witty wisdom from our most precious philosophers.